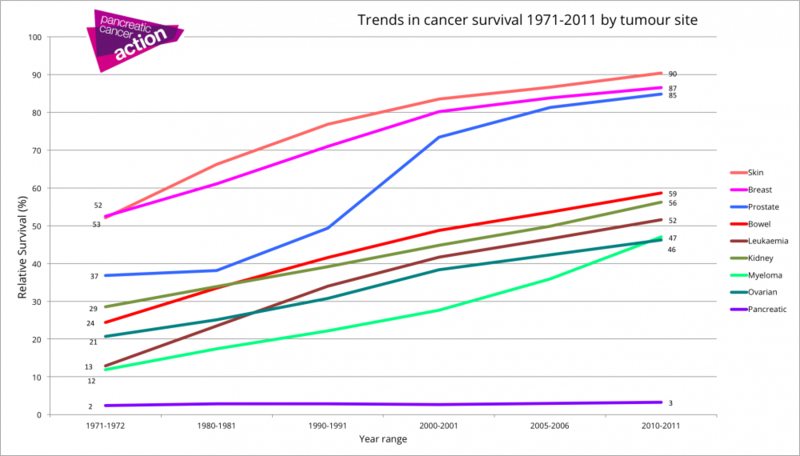 The graph below shows the trend in survival since 1971 to 2011 for major tumour sites, including pancreatic cancer. It is clear that in some cases vast improvement in survival has been achieved for these tumour sites. The notable exception is pancreatic cancer where change has amounted to a fraction of a per cent. While funding for pancreatic cancer research has increased marginally over the past 10 years it still accounts for only one per cent of overall research funding and only two per cent of site-specific funding. This is despite it being the fifth largest cause of cancer death in the UK. Of the £521 million spent by the National Cancer Research Institute partners (NCRI) in 2013, only £5.2 million was spent on pancreatic cancer. In contrast, Breast cancer received £42 million, Bowel cancer, £23million, Leukaemia £32 million, and Prostate £17million. Ovarian cancer, which affects 6,955 women annually,(approx. 1400 fewer than pancreatic cancer) received nearly three times more funding than pancreatic cancer in 2011. Ovarian cancer has a 41 per cent five-year survival rate, pancreatic cancer has just over a three per cent survival rate. The table below highlights some of the funding inequalities that exist by cancer site. 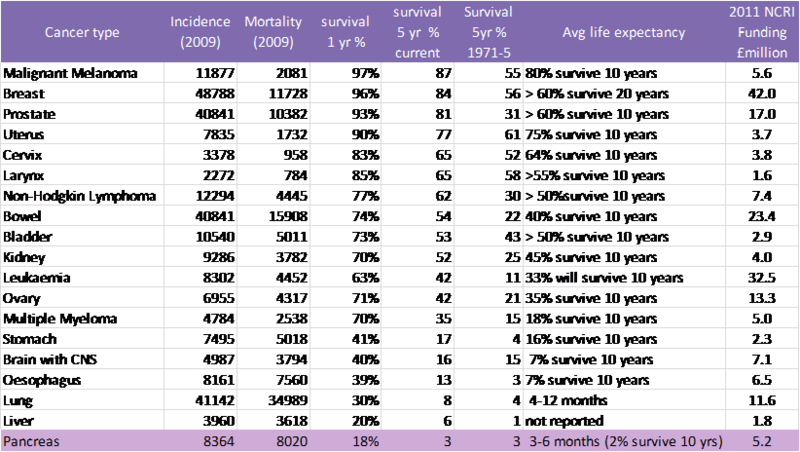 With a comparison of survival rates from the 1970s and current, along with incidence and mortality data, it is clear to see a correlation between investment in research funding and improvement in survival rates. 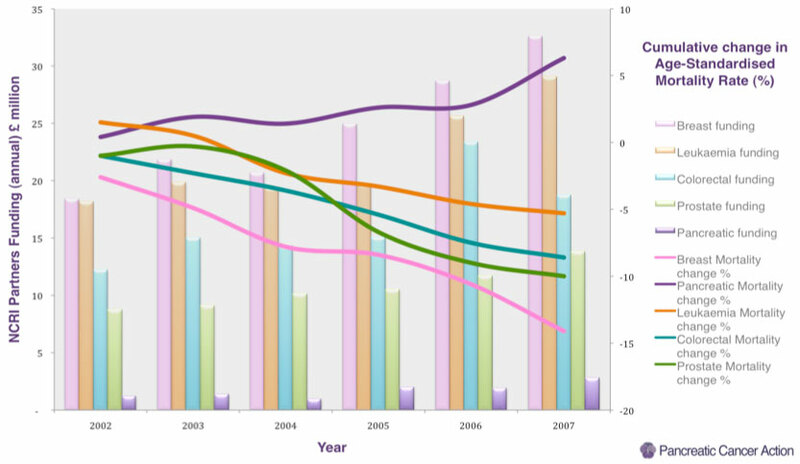 Lack of investment in pancreatic cancer research is illustrated by the fact that survival rates for the disease have not changed over this period.